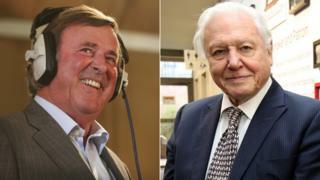 Image caption Sir Terry said in his letter that his reason for writing to Sir David was "simply ambition"
Sir David Attenborough turned down the late Sir Terry Wogan for a presenting job, according to newly uncovered letters. Sir Terry wrote to Sir David in 1965, at the age of 27, asking to be considered for work at the BBC. But Sir David, who was controller of BBC Two at the time, declined the request. He wrote back to say the network already had chief announcer who was from Dublin. Sir David now says he has no recollection of the exchange. The initial letter, published in this week's Radio Times, Sir Terry said that he "should like to extend the sphere of my television activities". He added that he wished to see whether "the success which I have enjoyed in Ireland can be translated to British television". At the time, Sir Terry was working for the Irish Broadcaster RTE. He admitted within the letter that his main reason for writing it was "simply ambition", adding that he hoped Sir David would be "receptive enough of new ideas and personalities". But Sir David replied: "We do not have any vacancies for anyone with your particular talents and experience." He went on to draw attention to a chief announcer on BBC Two - Denis Tuohy - who he said was from Dublin but is actually from Belfast. "We would feel, other things being equal, that we should look for someone from a different part of the country if we were to make an additional appointment," he wrote. When Sir David was informed by the Radio Times of the exchange, he said: "Good Lord, he wrote to me asking for work? I don't remember this at all." The natural history presenter said he received more than 10,000 letters a year during his stint as a BBC executive. Sir David added that, despite meeting Sir Terry many times in subsequent years, the Irish presenter never mentioned the rejection letter. But the 89-year-old stands by his decision. "I think it was a perfectly reasonable answer. To have had two Irishmen presenting on BBC Two would have looked ridiculous." He added: "This is no comment whatsoever on Terry Wogan's talents. It's just that I couldn't have had two Irish presenters." After the rejection, Sir Terry turned to radio and, in 1966, was offered a job presenting Midday Spin on the BBC Light Programme - which later became BBC Radio 2. In later years Sir Terry would go on to present the hugely successful breakfast show on the network, serving a total of 27 years fronting the flagship programme. Sir Terry Wogan died last week at the age of 77 after a "short but brave battle with cancer".